The storyline at this year's Figure Olympia is the same as last year's, and the two years before that. Those of you who follow the IFBB Pro Figure division know I'm talking about the matchup of Nicole Wilkins versus Erin Stern. One of the two has been champ, and the other one runner-up, for three Olympia Weekends running. Is 2012 finally the time someone can shake things up and knock one of the two of them down a peg? With the seasons Stern and Wilkins have been having, it doesn't look any more likely than usual. Jelena is without question one of the most beautiful women in the IFBB. Unfortunately for her, the Olympia is about more than just stunning looks. She's gone back and forth between bikini and figure. She didn't appear comfortable on stage when doing bikini, so she committed to figure and it paid off. She hasn't competed since the Arnold where she finished 10th. Jelena qualified for the Olympia by finishing in second at the 2011 Houston Pro. She'll need to bring in a tighter lower half than we saw in Columbus to be in the hunt. This will be Jelena's third Olympia. Teresa is a testament that patience pays in the end. This is her fifth Olympia, and in that time she's progressed from 16th in 2008 and 2009 to fifth last year. She's competing at the Tournament of Champions show and will have time to fine tune before the Olympia. By now, she knows what her strengths and weaknesses are. She has long limbs, but her legs can sometimes appear smaller than her upper body. Teresa has learned to balance her physique over the years, and if she comes in full, she'll be among the top spots. Ava is definitely a fan favorite, but will she be the judges' choice for a top spot? She was third at the 2011 Olympia but slipped to fourth at the Sheru Classic shortly after that. She matched that with a fourth-place finish at the 2012 Figure International. Ava wasn't pleased with the way things played out in Columbus and changed things up for the New York Pro. It wasn't quite a winning look, but she finished in third. Ava has a tendency to come in too hard and it makes her look more like a women's physique competitor than a figure competitor. If she can find the right balance of conditioning she should be in the top six again. Jami has been on a roll since turning pro at the 2011 NPC USAs. She's never finished lower than fifth in a show, except the big one last year. She placed 16th at the 2011 Olympia and is looking to redeem herself. She's coming off a win at the California Pro, and if she gets into the top 10 with this lineup I would call it a win for her. Heather has changed up her physique since turning pro at the 2010 NPC Nationals and it has paid dividends. This will be her second Olympia, and I doubt we'll see her in 13th like we did last year. Heather made her presence known at the 2012 Figure International when she finished in fifth. Look for her to be a top contender this year and possibly someone who could shake up the top six. As long as she's not too hard with her conditioning, she'll be in the mix. There is so much potential with Alicia, but will she embrace it? Will she bring what she's capable of to the stage? She has a habit of starting the year off slow and ending strong. If she repeats that she'll be in the top spots again, but if not she'll be relegated to a similar placing like she had to start the year. This is Alicia's fourth Olympia, and she's finished in sixth the last two years. It's all about conditioning and her diet. If she's dialed in she'll be in the mix. If not, she could be out of the top 10, like she was in 2009, when she placed 13th. Candice has been on a hot streak this year. She placed 16th at last year's Olympia but since then she has in the top five in five shows and took home top honors at the Pittsburgh Pro. The win in Pittsburgh was her first ever as a pro. If she can bring that look to the Olympia stage she'll be a contender. She fixed little details like hair, makeup, suit, and posing, and it made a big difference. Candice probably has the best chance at cracking the top spot among competitors not named Erin or Nicole. She has positioned herself as a viable threat for a win in every show she enters. She was fourth at the 2011 Olympia, and since then she has finished third twice, both times behind—you guessed it—Nicole and Erin. Candice has won her last two shows and carries the confidence she needs to disrupt the top spots. There's not much more she can do but keep doing what she's done the last two shows. The third Candice of the show is the one who could have the most people wondering, "Who is that?" This will be Candice's first Olympia, but she comes in strong after having found a winning look. She has crazy genetics and one of the tiniest shoulder-to-waist ratios you'll see on stage. She won the Omaha Pro and Chicago Pro this year, and if she can match the look she brought there, look out contenders! Candice's biggest struggle is her legs. They can and have been too big on stage. If she keeps the wheels in check she'll be in the mix. Chelsea will be competing in her second Olympia, and like some of the other women, she has yet to crack the top tier at the big show. She placed 12th at the 2011 Olympia, but more recently took fourth at the Chicago Pro. Cracking the top 10 would qualify as a good showing for her. She usually holds her own from the front, but when she turns around, she drops a few places. If she's improved her back and hamstrings it will help her move up. Monica beats a familiar tune here. She holds her own in the smaller shows but falters when it comes to the Arnold and Olympia. Monica won her first pro show earlier this year and is coming off a fourth-place finish at the 2012 New York Pro. She should definitely move up from her 16th-place Olympia finish from last year. She'll just need to be conditioned from the back, especially in the glutes and hamstrings. Erin is determined to get back the title she once held. Erin was crowned the Olympia champion in 2010, but hasn't beat Nicole in the Arnold or Olympia since. 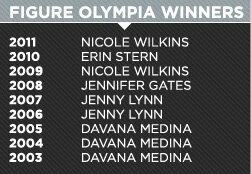 This will be Erin's fourth Olympia, and she hasn't finished lower than second here since 2009, when she was sixth. Erin didn't beat Nicole at the Figure International this year, but she did beat her at the Australian Pro the week after. Erin has to stick with what works for her. She came in a bit too small at the Arnold this year, but if she returns to a fuller look she'll be tough to beat. We'll get a sneak peek at Erin when she competes at the Valenti Gold Cup three weeks out from the Olympia. Gennifer is up and down in her placings and has yet to make it into the top six at the Arnold or Olympia. She placed ninth this year at the Figure International and has three top-three finishes since then. This will be her third Olympia, and if she can keep her legs down but not stringy, like she has in the past, she'll be in the hunt for the top 10. She has to stay full to be a contender. Alea is coming off her first pro win and will bring a ton of confidence to her second Olympia. She placed 14th at the 2011 Olympia and since then has consistently been in the top six of every show. If she brings the same look she did from the night show at the Omaha Pro, where she finished second, I think she can crack the top 10. Alea is one of the few who has successfully switched from bikini to figure. Ann brought her best look to date at the Tampa Pro and shocked a number of people by winning. she placed 16th at last year's Olympia and should improve upon that finish this time around. The key for Ann is to stick with what works and not try anything new, which means no new tanner, no new suit, hair, or makeup. Rosalind has a great physique, but it wasn't until this year that she got the love many felt she deserved from the judges. This will be Rosalind's first trip to the Olympia after winning the Toronto Pro. Prior to that victory, Rosalind's highest finish was seventh, and more often than not she was outside of the top 10. She packs a lot of muscle on her frame, and that has been her downfall. Some feel she is better suited for women's physique competitions, but we'll see how she fairs at her first Olympia. After she failed to defend her title against Erin Stern at the 2010 Olympia Weekend, Nicole made it clear that she never wanted to experience that feeling again. If she wins this year, she'll match Davana Medina's record of three Figure Olympia titles. Nicole wasn't at her best at this year's Figure International but still pulled out the win. The judges like what she brings to the stage, and she'll be tough to beat. Nicole only has two second-place finishes since 2009, both coming at the hands of Erin Stern. We'll see at least five more women in the show once the Olympia Qualification Series wraps up in the coming weeks. There are a number of scenarios that could play out, but as of the start of September, the top five spots in the points standings were filled by Allison Frahn, Natalie Waples, Larissa Reis, and tied for fifth, Cheryl Brown and Andrea Cantone. Krissy Chin also qualified for the Olympia but will not be competing. She is expecting her first child in the coming months, which is definitely an excused absence from the stage. Congratulations to Krissy and her husband Troy.